Poker is supposed to be a game that combines strategy and luck. However, cheating at poker is a pretty commonplace occurrence. This is a concern for any casino operator for how anyone can cheat at this game. But it is still something that occurs quite often. Here are a few of the ways how people often cheat at this game. You must watch for these points when you are playing a game so you will not be a victim of any of these commonplace threats that might develop in a game. More about poker. 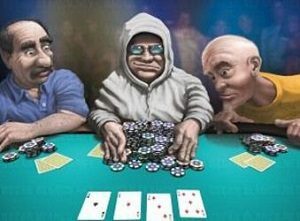 This is a commonplace activity that occurs at live poker tables. With this, a player might make a slight and distinctive bend on a card. This is to try and make a certain card a little more visible on the table. This can entail some minute details or alterations but it can be easy for many professional casino employees to spot when some cards are marked in some way. An invisible liquid can be applied onto a series of cards. This is a liquid that can only be seen with infrared light. A particular series of contact lenses are then worn by a person. This allows a person to see infrared light. The person who wears the lenses can easily spot the cards that have been marked. This is an elaborate trick that often requires a person to get into a casino system and get one casino employee to ensure that cards are marked in some way before an event. This is an illegal form of cheating that can get plenty of people in trouble. Even so, it is something that might be difficult to spot. A poker player might get in touch with someone who wants to play along in the future. A player might become a good accomplice of someone online. While interacting with someone for a while online, particularly through an online chat program, a person might send a malware program onto one’s computer. The malware works with whatever online poker program someone is using. This allows a player to see the hole cards that a target gets. This is a threat that can be exceptionally dangerous. It can harm one’s computer with ease. This is something that is often done when a player has developed a great relationship with another online and could be a sign that someone is really trying to be nefarious and dangerous when playing a game. Pre-installed malware may be used in some poker games. In this, a person might sell computers to poker players with those computers containing pre-installed software that can reveal one’s hole cards. This is a concern that a typical player might not notice as that person could start losing big time without knowing that one’s cards are being exposed. This is often an elaborate trick for cheating at poker that is used by those who get great relationships with other poker players up and running. It is a concern that must be explored when trying to get a certain game ready. Some people who really know more about other poker pros that they are playing with might find ways to get information on where they are located. They might get cameras installed inside the homes of other poker players that they want to beat. When this happens, a camera is installed in an area that a person’s computer is located in. This allows a player to identify what one’s cards might be. The camera would have to be aimed at a player’s screen for this to work. Also, the camera would have to be clearly concealed. It could be in a hidden object that is adjusted in some way. The key is that it would have to be kept secret to where nothing could be found. Of course, whoever installs the camera would have to get it in there in some extremely elaborate and secretive way for it to actually work. An interesting way how a player might cheat comes from the use of fake bloggers. In this, some person might be at an event assigned to be sideline reporter for online sites. This is often used to identify different types of things that might happen in a match. The biggest concern here is that a fake blogger might try and steal information on one’s hole cards while signaling them to another player. This is used to give the player who gets the information an advantage. This is especially something that can take place at any kind of event including a physical event. The potential for information to be given out to another player in this manner can be rather sizeable and should be seen carefully. 7. What Is Online Collusion? Online collusion is a problem that has impacted many online poker sites over the years. Collusion is an activity where some kind of conspiracy may be established as a means of trying to cheat at someone or to at least be deceptive. When collusion occurs, players might establish a series of accounts with smaller monetary totals. This could make it to where many people will be linked together to try and gather information on other players. This is something that had been used in sit-and-go tournaments over the years. This has also been something that was used by many players from the same country at different sites. This was particularly commonplace in China as more people from that country would keep on trying to gather as many details on players as possible within a game. The sit-and-go format has been discontinued from a variety of online casino games thanks to the issues that come from collusion. The key of more advanced formats for seating players is to ensure that collusion will be less likely to develop within a game. A superuser account is one where a person might get access to more functions on a particular online poker site. Cheating can occur with such accounts in that a poker room itself will have been involved in the cheating process. With this, a person might try and grab information on certain players through a moderator program while playing. This is a form of cheating that is not very easy to spot but it is not something that occurs as often as it used to be. Poker rooms will have to be a little more under control to ensure that the risk of data being stolen or used will be minimal. The goal is for a poker room to be more supportive of players and to ensure that data from those players is not going to be used in any harsh or difficult manner. Counterfeit chips are often used at a number of casinos. These are casinos that are designed to look like and weigh as much as other traditional chips in a game. These chips can be rather dangerous because it is tough to identify them from others. They can also become rather difficult and hard to use in some way. These chips can especially be found online. This works in that people can get online to get extra chips illegally. This might work with a plan to adjust one’s chip total without having to spend any extra money at a time. It could potentially make it look as though a person clearly has more to work with at a certain time than anyone else playing a game. The last concern to watch for entails how chips might be altered in a variety of ways. In some cases chips might be painted or some stickers might be added onto them. The goal is to make chips look different from what they are originally like. This can be used at many physical casinos to try and cheat people. It especially shows that certain chips are worth more than others in a certain game. This is a problem that often influences a number of games it can be a real threat. It is a problem that should especially be seen carefully for how difficult it can be to pick out the counterfeit cards from the others in a game. The cheating acts are common concerns that can especially be rather difficult. You would have to watch for how well a great game can be organized and that it is maintained well to ensure that you aren’t being a victim of cheating. Even more importantly, you have to be observant of the other players you are with and the general communications that you might get into when playing a game.